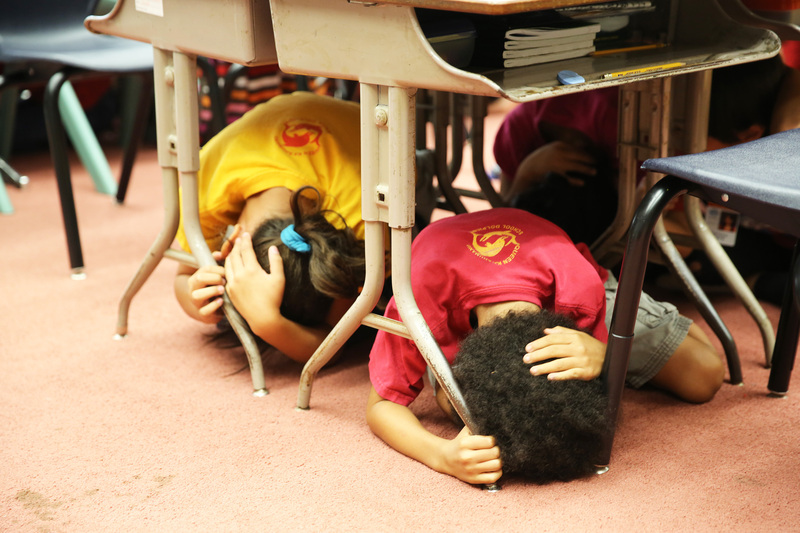 HONOLULU — More than 240,000 people across the state took a moment to “Drop, Cover and Hold On.” The Great Hawaii ShakeOut earthquake drill occurred at 10:15 a.m. as part of a larger international campaign for earthquake education and preparedness. Spearheaded locally by the Hawaii Emergency Management Agency (HI-EMA) and its partners, thousands who registered for the drill practiced those three simple lifesaving steps. Today marks the ninth anniversary of the Kiholo Bay earthquake. In 2006, a magnitude-6.7 earthquake occurred offshore from Kiholo Bay on the west-facing side of Hawaii Island. Followed by several aftershocks in addition to a shallower and slightly weaker magnitude-6.0 quake to the north, the Kiholo Bay earthquake resulted in severe damage to Hawaii Island’s infrastructure and its effects reached up the island chain. Local, state and federal emergency management partners in Hawaii participated by following the earthquake drill with an internal communications exercise, testing tools such as the Hawaii Warning System (HAWAS), which allows them to transmit and receive emergency messages statewide. According to another key partner in this year’s drill, the U.S. Geological Survey Hawaiian Volcano Observatory (HVO), Hawaii has a history of powerful and destructive earthquakes. Hawaii experiences large earthquakes with a magnitude-6.0 or higher on a regular basis, roughly every five to ten years. Some are strong enough to cause physical damage and impact residents on all islands. Earthquakes can cause landslides and tsunamis. A locally generated tsunami is one of Hawaii’s greatest natural threats. Powerful tsunami waves can travel at the speed of a jet plane, allowing residents only minutes to evacuate to safety. After shaking from an earthquake has stopped, people should move immediately to higher ground and away from the ocean. Additional partners who supported the coordination of this year’s drill included local emergency management and civil defense agencies, Pacific Tsunami Warning Center (PTWC), State Public Charter Schools Commission, University of Hawaii at Hilo and American Red Cross. 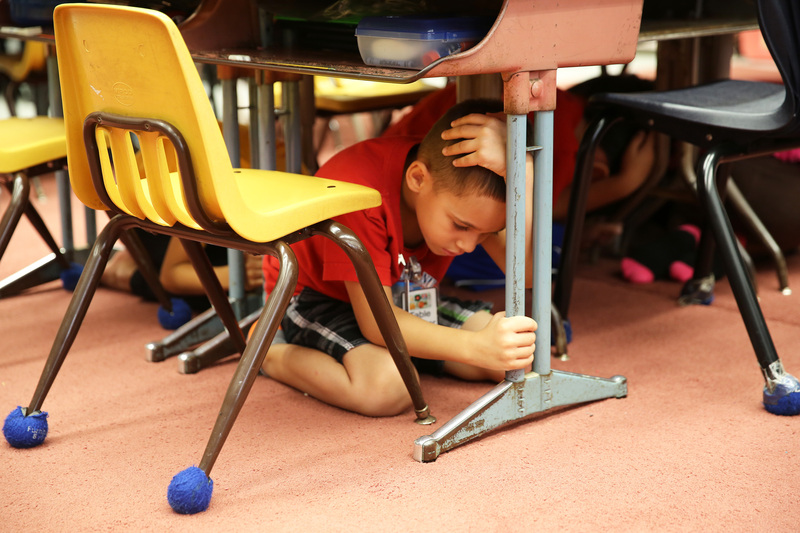 ShakeOut began in Southern California in 2008, and Hawaii County has participated in the drill for the past two years. It has grown into an internationally recognized campaign with millions of participants taking part each year. To learn more about the Great Hawaii ShakeOut and earthquake preparedness, visit www.shakeout.org/hawaii. 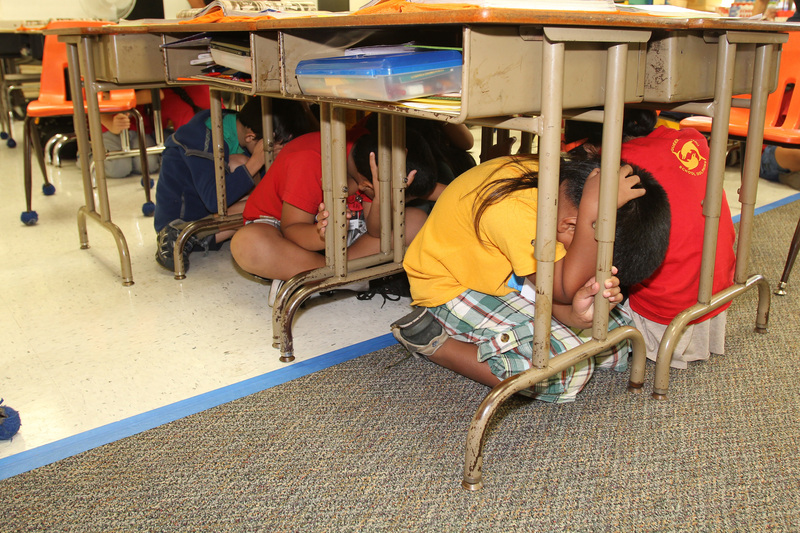 Description: Students practice how to “Drop, Cover and Hold On” during the Great Hawaii ShakeOut. Description: All schools within the State Department of Education were asked to participate in today’s drill, which took place statewide at 10:15 a.m. 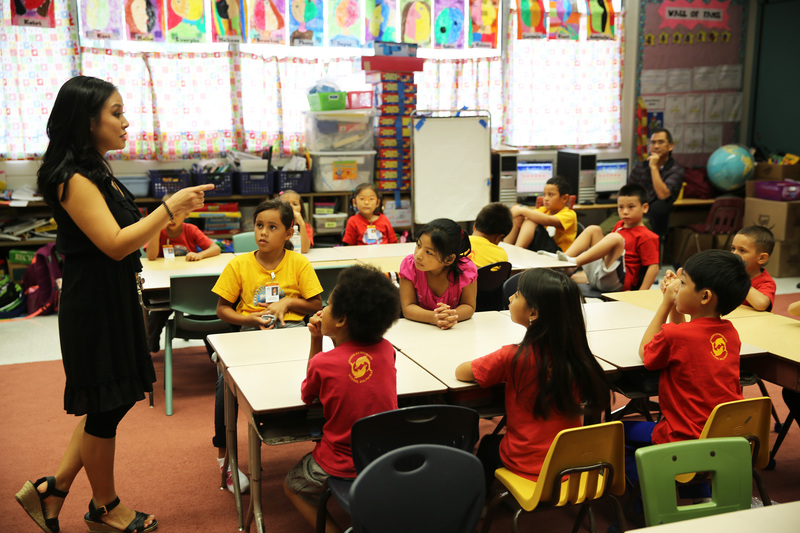 Description: Brooke Manangan (left), a counselor at Queen Kaahumanu Elementary School, debriefed with Mrs. Takenishi’s 2nd grade class, discussing what they learned today about earthquake safety. 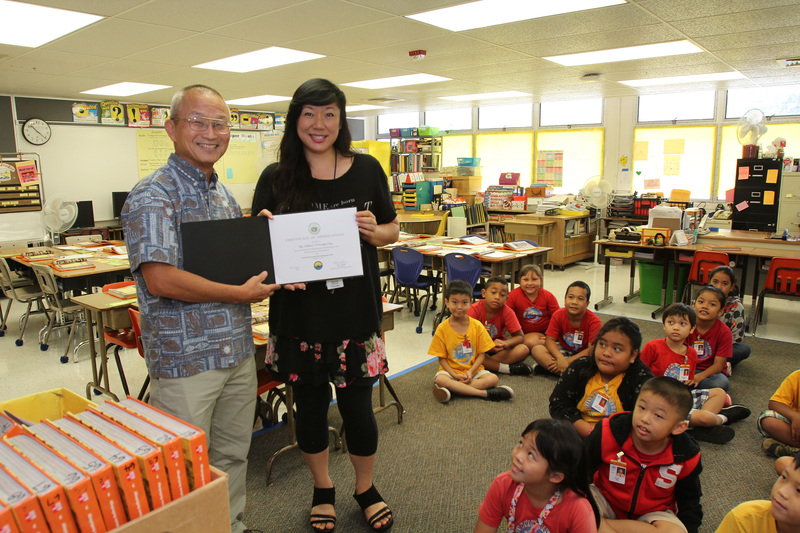 Description: Vern Miyagi (left), Administrator of Emergency Management, presented a certificate of appreciation to Ms. Renee Oshiro (right) and her 3rd grade class for their participation in the 2015 Great Hawaii ShakeOut earthquake drill.